Victoria, Mahe (Seychelles) – January 7, 2019 (travelindex.com) – Welcome to the first edition of our Volume 3 series. This year is not set to be an easy one for Seychelles as hinted or otherwise echoed by the President of the Republic at his last Press Conference, and also reiterated by the Leader of the Opposition during his closing remarks in the National Assembly’s last session for 2018. A difficult year with many new cost increases are set to make the lives of the ordinary Seychellois even more difficult as businesses are also going to be hit in one way or another. The difficulties Seychelles will experience in 2019 are all man-made and locally legislated. 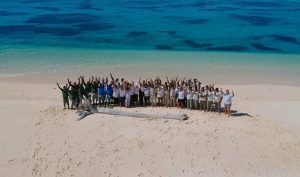 Today, we speak of our Blue Economy as a newly discovered national asset, yet Seychelles has been a leader in the field of Conservation for many years. Our Conservation Policy protected our seas, today positioned at the very centre of the Blue Economy, and our island’s policies was aimed at protecting our assets both above and below the sea. Sea Turtles were protected, and hunting with Spear Fishing Guns was banned. Lobsters were fished in dedicated season and Sea Cucumber fishing was per a quota system. National Parks were created and the concept of Wild Life Clubs were introduced. Seychellois fought for the return of their three islands that formed part of the British Indian Ocean Territory (BIOT) and we objected to the creation of the military base on Aldabra, favouring instead, to have a Nature Reserve created. Today this same reserve is a UNESCO World Heritage Site. The Vallee de Mai Gardens of Praslin were also declared a Nature Reserve with thousands of acres of prime land all in the name of conservation. Protection versus destruction brought positive results as the Seychellois made sacrifices in safeguarding their territory. Beaches were cleaned and reefs protected, fishermen were encouraged to be more conscious of their industry and boat owners played their part. Was that the Blue Economy? We did not say Oil but said conservation. The sacrifices by Seychelles and the Seychellois may all be wasted efforts if now in 2019 a military base is to be set up just next door to Aldabra the island our parents and grand parents fought to see its return from Great Britain. The Blue Economy is a nice talking subject but Seychelles must walk the talk to be taken seriously by us Seychellois first. Mr Corgat’s call for ratification of the Government’s decision for a military base comes as our Renowned Environmentalist Nirmal Jivan Shah said in his own post:- Danger, Danger! A new study reveals that Seychelles, Bangladesh and Cocos Keeling Islands have high rates of sea level rise. These regions are therefore highly vulnerable to coastal flooding induced by the accelerating sea level rise in future decades, posing significant threats to coastal communities and ecosystems. The findings published in the Journal of Hydrology indicate that vertical land motion is an important factor affecting sea level changes for the regions of Seychelles and Cocos Islands. There is a strong relationship between air temperature and sea level rise for all studied regions. Murla Marie from the Seychelles Tourism Academy (STA) has confirmed that Cheftestant Tracy Celine URANIE will represent Seychelles and Mentor Chef Erryl Jeremiah Morel will be spearheading the island’s team for the 5th International YoungChefOlympiad 2019. The opening of doors for our young Seychellois is a responsibility of the islands and we can say Congratulations to The Seychelles Tourism Academy (STA) for standing behind our young professionals. Experience is gathered through such events and the Seychellois Team will return home ready to share with colleagues and friends all they have picked up in this continuously evolving trade. The recent posting on Social media announcing that effective 1st January 2019 the removal of Etihad Guest Program and Partner Airline in Air Seychelles Public Announcements raised many an eyebrow. It should have been expected ever since Air Seychelles became part of the Etihad Holdings and was removed as part of the Etihad Airline body. Air Seychelles Crew conducting the Public Announcements must now refrain from mentioning “EY (Etihad) Guests programme script, Etihad Airways and Partner Airline” according to the note posted on Social Media for all to see through staff connections. This is a blow to Air Seychelles as it will be seen by all as an adverse situation. The second even more contentious discussion point is the ‘subsidising of travel to India’ by Seychelles. Advertised flight rates by Air Seychelles posted only five days ago states the following:- Johannesburg to Mumbai South African Rands 5306 for flights between 1 January to 30 June and a flight from Johannesburg to Seychelles is South African Rands 7792 for travels during the same period. India is some 5 hours more one way from Seychelles and it is cheaper to fly via Seychelles and benefit of some Rands 2400 per ticket. A straight promotion for travel to India over holidays to Seychelles. Flights from Seychelles to South Africa are advertised at Seychelles Rupees 7169 or South African Rands 7366. Similarly a Seychelles to Mauritius ticket cost if available Rupees 7813 and a Mumbai to Mauritius is being advertised at Indian Rupees 38071 (Seychelles Rupees 7469 approx.). Air Seychelles was and should be the partner for the tourism industry of Seychelles. It was created as the insurance policy for the islands tourism industry. Today we have moved away from these key principles and we are acting as just an airline looking at itself. This principle should push Government to open 5th Freedom Rights to create competition on the Seychelles route to help tourism and Seychellois with their travels.